Citation: Yuldoshov SA, Atakhanov AA, Sarymsakov AA, et al. Cotton Cellulose, Microcrystalline Cellulose and Nanocellulose: Carboxymethylation and Oxidation Reaction Activity. Nano Sci Nano Technol. 2016;10(6):106. Comparative study of reaction activity of cotton cellulose, microcrystalline cellulose and nanocellulose during periodate oxidation and carboxymethylation were investigated. The functional composition of this cellulose samples were studied and determined the number of formed functional groups in the hydrolysis products. It was found that increase of reaction activities among cotton cellulose-microcrystalline cellulose-nano cellulose depend on quantity of formed functional groups and their high surface area in the same sequences. Also investigated carboxymethylation reaction kinetics of cotton, microcrystalline and nanocellulose and determined the activation energy for etherification process. As known, ultra-small nanomaterials have unique physico-chemical properties, such as developed specific surface, high bonding ability and increased reactivity, which are different from macroscopic materials of the same composition [1,2]. These properties significantly expand application areas of the nanomaterials. Currently the main technical applications of nanomaterials are in the fields of nanocomposites, nanochips, nanosensors, nanoscale labels and indicators. In pharmaceutics and medicine nanomaterials can be used as carriers for drug delivery, implantants, as well as for advanced treatment and diagnostic methods, etc. . Among various organic materials, namely cellulose is the most appropriate for preparation of various types of nanomaterials, since this nanostructured natural polymer has unique properties such as low density, hardness and abrasivity, ability to structural and chemical modification, biocompatibility, biodegradability in the nature, etc. [4,5]. Cellulose is the most abundant natural biopolymer on earth, which is renewable, biodegradable, as well as non-toxic. It is a carbohydrate polymer made up of repeating β-D-glucopyranose units and consists of three hydroxyl groups per anhydroglucose unit (AGU) giving the cellulose molecule a high degree of functionality. The knowledge of the molecular structure of cellulose is of prime importance as it explains the characteristic properties of cellulose, such as hydrophilicity, chirality, biodegradability and high functionality. As a renewable material, cellulose and its derivatives have been widely studied, focusing on their biological, chemical, as well as mechanical properties [6,7]. Resource of cellulose in the nature increases by means of biosynthesis on 75 billion tons yearly. Therefore, production of cellulose nanomaterials has unlimited source and can be inexpensive. Microcrystalline cellulose (MCC) is purified partly depolymerized cellulose prepared by treating -cellulose, obtained from cotton cellulose, with mineral acid . In the process of acid hydrolysis, the non-crystalline region is preferentially hydrolyzed, so the cellulose crystals are released. In an initial stage of the hydrolysis, the degree of polymerization (DP) of cellulose decreases dramatically, but it approaches to a constant DP value, which is known as the leveling-off degree of polymerization (LODP). Nanocellulose (NC) obtained from concentrated acid hydrolysis of MCC, has been realized as a new class of nanomaterials. Compared to cellulose and MCC, NCC possesses many advantages, such as nano scale dimension, high specific strength and modulus, high surface area, unique optical properties, etc. These amazing physicochemical properties and wide application prospects have attracted significant interest from both research scientists and industrialists . The Aim of this work is comparative investigation of cotton cellulose, MCC and NC reactivity on the carboxymethylation and oxidation reactions. Cotton cellulose (CC) was obtained from Baxtteks-Farm with purity 99.0%, microcrystalline cellulose (received from our center, MCC medical, degree of crystallinity 80%, purity 99.0%), nanocellulose (received from our center, purity 99.0%, degree of crystallinity 89%), iodic acid (Budapest, Hungary, purity 99.5%), monoclorine acetatic acid (India, purity 98.5%) and used for oxidation and CMC preparation. Particle size of cellulose was determined by the AFM and SEM methods. For the oxidation of the samples was used 2% to 5% aqueous solutions of iodic acid (Chemreagent, Uzbekistan), oxidation unit was 1:5 to 1:10, the oxidation temperature was 22°C to 25°C. Carboxymethylation of cellulose samples performed by pretreatment with alkaline solution followed by etherification of the sodium salt of monochloroacetic acid. Functional groups of the samples were determined by Chemical Derivatization and ESCA Analysis . The content of sulfonic groups was determined by elemental analysis. The kinetics of the oxidation reaction was determined by potentiometric titration by measuring the amount of flow of oxidant periodic acid HJO4 and produced iodic acid HJO3. Provided the carboxymethylation reaction of CC, MCC and NC in adiabatic condition and determined the kinetics of reaction by the method . On base of obtained results calculated activation energy, reaction rate, constant of reaction rate and pre-exponential factor of cotton, microcrystalline and nanocellulose by using Mathcad software package. During the acid hydrolysis reaction, cellulose occurs to hydrolytic-oxidation process, which this process brings to decrease of particle size, degree of polymerization and formation of new functional groups, especially, aldehyde and carboxyl groups. Table 1 shows how influence concentration of sulfuric acid to particle size and content of aldehyde groups of cellulose samples. According to the figures, treating of cotton cellulose by sulfuric acid at the concentration from 10% to 66% particle size of samples decline from 4 mm to 290 nm and content of aldehyde, carboxyl groups and Sulphur increased from 0.04% to 0.267%, 0.024% to 0.039% and 0% to 1.35% respectively. Table 1. The content of aldehyde and carboxyl groups and Sulphur in hydrolyzed celluloses. The functional groups, formed after hydrolysis, increased reaction activity of celluloses in oxidation and carboxymethylation. In acid hydrolysis reaction simultaneously makes up partial substituted sulphocellulose (Figure 1). Figure 1. Partially esterification of cellulose by concentrated sulfuric acid. Increasing the concentration of hydrolyzing agent, particles size of cellulose decreased but content of Sulphur increased that confirmed partial etherification of cellulose at the hydrolysis process. Oxidation reaction kinetics of CC, MCC and NC by periodate acid were studied. Periodate oxidation of cellulose is irreversible and it is break the glucopiranosic cycle between atoms ?2 and ?3 by formation dialdehyde link. The speed and degree of oxidation of cellulose is depending on structure of cellulose and oxidation conditions. For the carrying out of cellulose oxidation reaction by periodate ions (IO4–) till dialdehyde-cellulose theoretically on each mole cellulose elementary chains required 1.0 mole IO4– thus degree of polymerization stays unchangeable . The mechanism of periodate oxidation could be concluded sorption of oxidizer in cellulose with formation of multiple ether - monovalent anion (I) which easy dehydrate anion (II), with the subsequent oxidation of cellulose, bring to decomposition of structure (II) to final product of reaction (III) by monomolecular electronic mechanism, taking place at intramolecular transformations . Quantity of absorbed IO4– ions in cellulose from solution equal to amount of oxidized AGU . Experimental studies of selective oxidation of CC, MCC and NC by IO4– ions showed that the amount of aldehyde groups is always less than the amount of absorbed ions. This difference increases on the number of CC-MCC-NC, and it is explained by a low decay rate of structures II to III by the monomolecular mechanism at the expense of intermolecular transformations (Figure 2). Figure 2. Oxidation mechanism of cellulose by periodate acid. Kinetic absorption curve of IO4– ions from oxidizer solution (Figure 3) shows at 22°? formation rate of complexes I and II significantly high for NC and MCC, and sorption of oxidizer at 2 h are 80% and 70% respectively. In spite of unique condition, CC forms complexes I and II only after 8 h that could be explained specificity its morphological and supramolecular structures. Figure 3. Dependence of content of IO4– ions (iodic acid) in solution on time at the process of oxidation of CC (-o-), MCC (-◊-) and NC (-?-). At the process of cellulose oxidation, the IO4– ions convert into IO3– ions iodine acids, characterize formation of structure III and by the calculating of quantity of IO3– ions can be determining of formed dialdehyde units. Formation rate of iodine acids (Figure 4) significantly slowly than absorption rate of iodic acid (Figure 3). Figure 4. Kinetic curve of IO3– ions (iodic acids) formation at the process of oxidation of CC (-o-), MCC (-◊-) and NC (-?-). Decay rate of structure II to structure III increases at the line of CC-MCC-NC was established. In addition to this, content of functional groups in initial samples of CC, MCC and NC also influence to oxidation rate. Investigations to determine the time limit oxidation of CC, MCC and NC samples subjected to periodate oxidation (Table 2) and found that periodate oxidation rate of NC higher than the CC. Table 2. Degree and time of oxidation of CC, MCC and NC samples. Nanocellulose high reaction activity in comparison with MCC and CC also observed in their heterogeneous carboxymethylation reaction, since the reaction rate is determined by the number of interacting components effective collisions per unit time. One of the main advantages of a heterogeneous solid-phase process for the preparation of CMC is the simplicity of hardware design, no production waste and fire safety. One of the problems with implementing a solid phase method is the difficulty in predicting the parameters of the final product. The reason for this is the lack of sufficient capacity of controlling product quality in the alkylation process, associated with temperature control the complexity of the process, from which depend on such important quality parameters of CMC, as the degree of polymerization and uniform distribution of substituents along the cellulose chain macromolecules. This in particular, due to the large thermal effect carboxymethylation process at high rate and adverse reactions at elevated temperatures and the complexity of heat removal. To solve this problem requires data to study the effect of temperature on the kinetics of carboxymethylation process. Comparative studies carboxymethylation of CC, MCC and NC at adiabatic condition that by excluding the heat exchange with the external environment at the maximum temperatures reached in 240, 150 and 45 min respectively (Figure 5). Figure 5. Dependence of exothermic carboxymethylation reaction temperature of CC (1), MCC (2) and NC (3) on time. Achieving maximum values of etherification reaction mass temperature is direct proportional to the magnitude of their surface area, since the length of fibrils CC average of 6 mm, MCC particle size is 250 μm and NC particle size is 400 nm. Carboxymethylation of CC, MCC and NC under adiabatic condition contributes to the exclusion of the heat exchange with the environment and the rise in temperature is directly proportional to the increase in the degree of substitution of products. Figure 6 shows the dependence of changes in the degree of substitution (DS) of CC, MCC and NC on esterification time. Figure 6. Dependence of degree of substitution of CC (1), MCC (2) and NC (3) on duration of etherification reaction. As seen in Figure 6, with an increase in the duration of the etherification degree of substitution of CC, MCC and NC reaches a maximum value 0.65, 0.78 and 0.97 at 70, 120 and 240 min respectively. 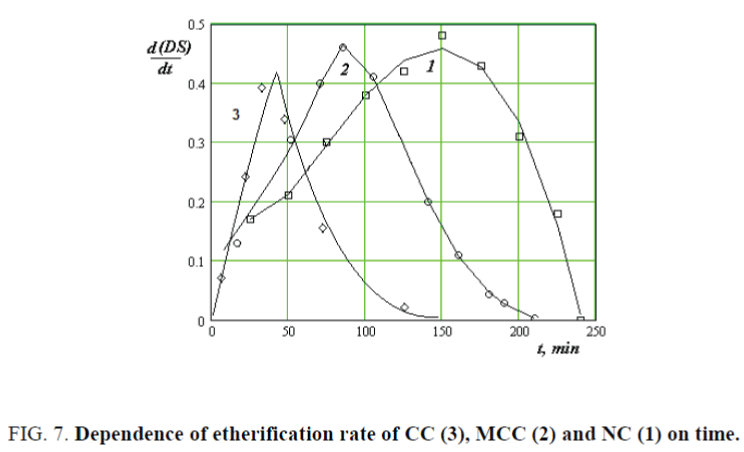 Determined etherification rate of CC, MCC and NC by the differentiation treatment of DS=f (T) values at different temperatures. As seen in Figure 7, etherification rate of NC is much higher than CC and MCC and it reaches a maximum of 40, 90 and 150 minutes respectively. Further, reaction rate is falls due to decrease of concentration of alkylating agent sodium monochlorine acetate in the reaction system. Figure 7. Dependence of etherification rate of CC (3), MCC (2) and NC (1) on time. According to the K=f(t) values described by the equation of K=?. ?E/RT activation energy and pre exponential factors of energy were determine. Activation energy of etherification reaction of CC, MCC and NC are 4.757?104, 3.957?104 and 2.645?104 J/mol and pre-exponential factors are 6.43?105, 86.41?105 and 220.4?105 respectively (Figure 8). Figure 8. 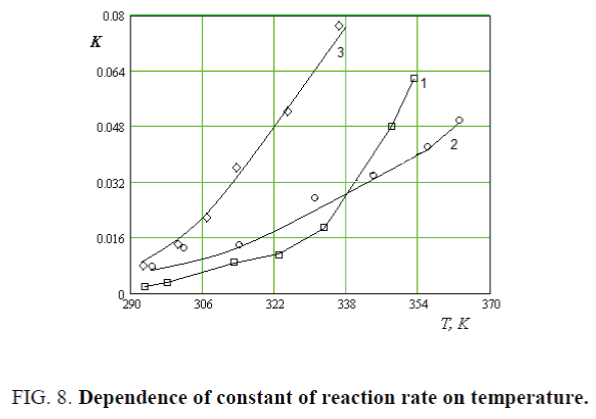 Dependence of constant of reaction rate on temperature. Thus, the functional composition of cellulose and its acidic hydrolysis products were studied. It was found that changing the condition of hydrolysis proceeds change particle size and amount of their functional groups. Comparative studies of mechanisms and laws of optimal conditions of periodate oxidation and carboxymethylation kinetics of CC, MCC and NC were carried out. An increase reactivity CC-MCC-NC during the carboxymethylation, at the expense of decreasing of degree of polymerizati-on, increasing of total reaction surface. In addition, rising of content of the terminal carbonyl and carboxyl groups during the periodate oxidation increase the number of effective collisions of molecules with oxidant glycol groups of glucopyranose rings. Hayashi Ch, Uyeda R, Tasaki A. Ultra-fine Particles: Exploratory Science and Technology. Westwood: Noyes Publications; 1997. Ioelovich M. Cellulose as a nanostructured polymer. Bio Res. 2008;3(4):1403-18. Yuldoshov SA, Sarymsakov AA, Saypiev TS, et al. JComp Mat. 2010;3:63-71. Ioelovich M, Figovsky O, Leykin A. Nano cellulose and its applications. Proceedings of 7thWorld Congress Nano composite-2007; 2007 Sep 05-07; Las Vegas, USA. Ioelovich M,Leykin A. Microcrystalline cellulose: nanostructure formation. Cellulose ChemTechnol. 2006;40:313-17. Coffey W. Finite integral representation of characteristic times of orientational relaxation processes: Application to the uniform bias force effect in relaxation in bistable potentials. AdvChemPhys. 1998;103:259-333.
de Sowza Lima MM, Borsali R. Rodlike Cellulose Microcrystals: Structure, Properties, and Applications. MacromolRapid Commun. 2004;25(7):771-87. Achor M, Oyeniyi YJ, Yahaya A. Extraction and characterization of microcrystalline cellulose obtained from the back of the fruit of Lageriana siceraria (water gourd).JApplPharmaSci. 2014;4(1):57-60. Braun B, Dorgan JR. SingleStep Method for the Isolation and Surface Functionalisation of Cellulosic Nanowhiskers. Biomacromol. 2009;10(2):334-41. Ostenson M, Jarund H, Toriz G, et al. Determination of Surface Functional Groups in Lignocellulosic Materials by Chemical Derivatization and ESCA Analysis. Cellulose. 2006;13(2):157-70. Yuldoshov SA, Sarymsakov AA, Ashurov N, et al. Kinetics of solid-phase carboxymetyllation of cotton and microcrystalline cellulose. Macromol Ind J. 2014;10(2):69-72. Syutkin BN, Nikolaev AG, Sajin SA, et al. Nitrogen contained derivatives carbonyl cellulose high degree oxidation. Khimiya Rastitelnogo Sirya. 1999;2:91-102. Najimutdinov S, Sarimsakov AA, Usmanov KU. Investigation some mechanism synthesis dicarbonyls cellulose and its simple ethers. Cellulose Chem Technol.1981;15(6):613-28. Lewin M. Oxidation and aging of cellulose. Macromol Symp. 1997;118(1):715-24.